Kawhi Leonard and his quad injury was the mystery of the 2017-18 NBA season. It ended up evolving from a mystery to an even better drama in the offseason. He didn’t like how the team reacted to his injury, so he wanted out. He told the San Antonio Spurs he wanted a trade—preferably one to the Los Angeles Lakers. But as any kid that ever asked for an Optimus Prime for Christmas but got a Shockwave instead can tell you– sometimes you don’t get what you want. San Antonio tried to send Leonard to LA, but the Lakers just didn’t make them an offer the Spurs could live with. As it turns out, the offer they could live with will not send Leonard where he wanted or even close. Instead, he’ll be moving out of the country. San Antonio is shipping him off to the Toronto Raptors along with Danny Green and $5 million (for the luxury tax hit). In exchange, they get DeMar DeRozan, Jakob Poeltl, and a protected 2019 first-round pick. It’s not enough this happens, but the trade is a win for all the parties involved. Leonard is a better defender than DeRozan. But the Spurs get a reliable scoring threat in a player that can only get better under Popovich. Toronto, after losing one too many times to LeBron James and the Cavaliers, wanted to shake things up. They wanted to make a change with hopes that the new dynamic could get them over the playoff hump and into the Finals. Leonard gets out of San Antonio. He’s not heading to LA like he wanted. But he does get to go to a quality team with championship aspirations. Not only that, but he will not have to deal with the media frenzy he’d see in LA. Some will call Toronto even taking part in the trade foolish. With James out of the East, the door to the Finals appeared to be wide open for the Raptors finally. Why not at least give the team a try to make it before busting things up? Probably because they know that if they did get to the Finals, they’d have to face off with the Warriors. The DeRozan-Kyle Lowry led Raptors couldn’t outscore the Warriors. But maybe a Leonard-Lowry one could play good enough defense so that they could. 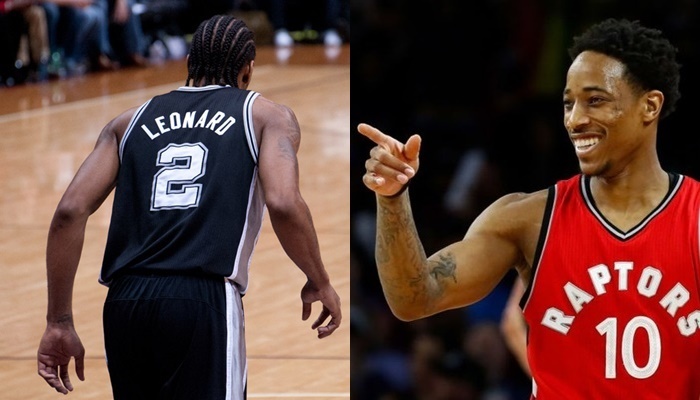 Some will not like the move because they think there is no way Leonard resigns with the Raptors. Maybe, just maybe, they can change his mind. Perhaps winning games and not dealing with an insane media will be enough to entice him to stay. There’s also the $50 million he’ll give up if he leaves town for the Lakers. Yeah, he’s said he doesn’t care about the money. But after listening to everyone in the NBA-loving free world talk about the $50 million he’ll be giving up maybe he’ll realize he doesn’t want to do that.